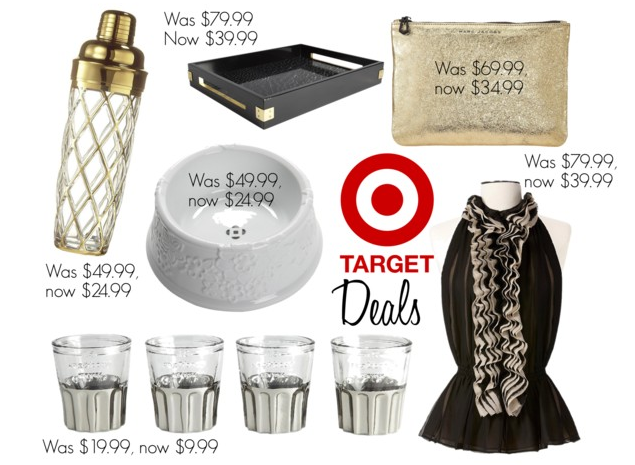 I've always loved when Target collaborates with top designers to create affordable creations. I was, however, a little disappointed by the prices of the latest collaboration the company had with Neiman Marcus. The brand names were there (Marc Jacobs, rag & bone, Tracy Reese, etc. ), proudly displaying their ability to make us smitten upon first glance, but what was missing was the quality that went along with the high prices. It was just not the best for the amount of money you'd be paying. We'll I think Target got the hint, because many pieces are now 50 percent off. This means I can finally afford that Altuzarra shaker I've had my eye on, and the Robert Rodriguez top with enough ruffles to channel Blair Waldorf at work. Are any of these items on your holiday gift list for you or others? oh the gold glittered wallet is amazing!! So glad! I def felt they were overpriced! Love that shaker and the glasses that matched it. The black tray is kinda perfect as well!